It's Friday, April 19 and welcome to the St.Winnoch Angling Club Home Page. The purpose of this site is to let people know about the excellent fishing in and around Lochwinnoch and also to show what club members have been up to. The area in and around the village of Lochwinnoch provides the angler with a wide variety of sport. Since 1927 the St.Winnoch Angling Club has provided members and visitors access to several waters within the local area at a very reasonable price. Boat and electric outboard now available on Castle Semple Loch. Contact Tom Sprought on number below. Strictly members only. Excellent coarse fishing with pike to 20lb+, roach, perch and eel. Salmon and sea-trout are also present in the loch as they pass through en route to the River Calder. Facilities include a club boat for use by any club member and any legal angling method is allowed here subject to club rules. 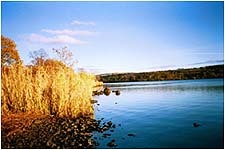 Offering the same species as Castle Semple Loch this water is situated within a R.S.P.B. managed nature reserve and the number of rods is limited to eight at any one time. Members only, no day tickets available. Around 5 miles fishing for wild brown trout in the scenic Calder Glen. Salmon have been returning to the river in increasing numbers and a planned fish pass at Bridgend Falls should ensure a healthy stock of migratory fish for the future. Two small burns situated close to Barr Loch. Mainly roach and perch fishing with occasional pike and trout. Queenside Loch is situated within the Clyde Muirshiel Regional Park and offers excellent brown trout fishing in stunning surroundings for those prepared to undertake the 40 minute walk from Muirshiel visitors centre. Fly fishing only at this loch. Permits to fish all waters on this site are available from St.Winnoch Angling Club at the following prices*. Much of the angling at Lochwinnoch is situated within, or close by, a wildlife reserve / areas of an ecologically sensitive nature and we respectfully request that all visitors please pay particular attention to local codes of practice and access arrangements at all times.